Not all of the apparently many things I did in May of last year were in Oxford, however much it might seem that way. I actually managed to squeeze a short research trip to Catalonia in between teaching as well! Because of the short time available, this had to be very targetted, and the strategic priority was the project on priests around Manresa, bits of which have already turned up here. 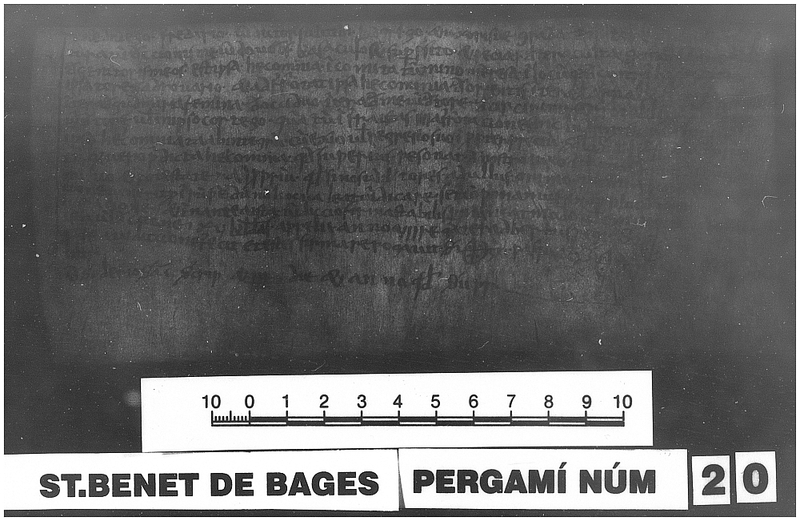 In May 2013 I was set to give two papers on this project in the next two months, and you may remember that while it had become clear that I was going to need access to the original documents to do it properly, so that signatures could be compared, I was not going to be able to get this out of the abbey of Montserrat, where most of Sant Benet de Bages‘s parchments have wound up. So instead, I had to try and get pictures of all the rest, or at least, all the rest where scribes about whom I was suspicious might occur. That actually seemed fairly feasible in a two-day trip, but it meant starting with this place, about which you have heard my reservations before. Archivo de la Corona d’Aragón, Monacals d’Hisenda, Pergamins de Santa Cecília de Montserrat, no. 6 recto, reduced from the much large image actually supplied to me. Here I was after Sunyer, whose signature you can probably distinguish at the bottom. So, inevitably, these turned up way after the papers were given, but they did turn up, in an odd-shaped package that turned out to contain a CD-R and a roll of microfilm. The latter was why one could only order a hundred Sant Benet documents at once; the ACA are not, apparently, going to digitise whole microfilms for you on demand. But since I’d chosen and paid for digital images, this was extremely annoying; I was now going to have to digitise them myself, at my own expense. It damped considerably my delight at how good the digital ones they had been able to send me had been (and indeed always are, it seems). And worse was to come. Pergamins Sant Benet de Bages no. 20 recto, likewise after enhancement. The verso image here I just couldn’t distinguish to enhance, I’m still not sure the charter’s actually in it. But folks, it doesn’t have to be like this, as I found even that same day (because since they wouldn’t let me actually see anything, I was done at the ACA quite quickly). So I trekked across town (photos will follow) and got myself to this place, the Biblioteca de Catalunya, which I’d never used before, and it became probably my second-favourite research library within the hour. It was no trouble at all to get a reader’s card, a five-year one even, and then it was equally unproblematic to identify and order up the five documents I wanted to see. And there they were, within half an hour, in plastic folders on my desk. And after I’d been looking for about five minutes, the desk attendant whom I’d asked about photography came back to tell me that actually these documents were all on the website, if that would make things simpler for me? The website’s lovely, too, another obvious point of comparison. The ACA has a portion of a larger state site, and the only means of electronic contact is a form that doesn’t work. The BC not only has all kinds of social media enabled but also a crowd-sourced transcription initiative.2 One could be forgiven for thinking they actually wanted people to use their collections. And it is a lovely place to sit and read, indeed, and I hope to do so more in the future. But the contrast between it and the ACA could really not be more sharply drawn! When I started off this post it was towards the end of some weeks re-reading Lewis Thorpe’s translation of the Ten Books of Histories of Bishop Gregory of Tours.1 This is obviously from a bit earlier than I work on, as Gregory died in 594, but it’s not earlier than I used to teach, and besides I own it, had not yet read this copy and it’s full of interesting things. If it wasn’t for the number of stub blog posts I already had queued up at the time of writing I’m sure I would have showered snippets upon you, but even with that still being true there was one bit I can’t pass up, because it has a very strange kind of inverse contemporary relevance. I can’t find any halfway-relevant manuscript images so here instead is a fairly gratuitous but nice picture of the medieval Tour de Charlemagne and modern basilica of St-Martin in the centre of Tours. Desiderius and Gregory would recognise none of this! “Groupe Basilique St Martin1 Dôme et Tour Charlemagne vue de la Place du Château-Neuf” by Doquang – Own work. Licensed under CC BY-SA 3.0 via Wikimedia Commons. 1. Gregory of Tours, The History of the Franks, transl. Lewis Thorpe (Harmondsworth 1974, many reprints). 3. The Latin can be found in Bruno Krusch & Wilhelm Levison (edd. ), Gregorii Episcopi Turonensis Libri Historiarum X, Monumenta Germaniae Historica (Scriptores rerum merovingicarum) I.1 (Hannover 1951). 4. Cf. Robert I. Moore, The Birth of Popular Heresy (London 1975), repr. Medieval Academuy Reprints for Teaching 33 (Toronto 1995), pp. 33-60, for Henry and his doctrines, lots more developed than this character’s but not without resemblances of technique. I mean, I’m probably more a fan of the 970s myself—so many exciting possibilities as Europe begins to have access to gold again, even if it comes with a side-order of Muslim military campaigns of terror in Spain and Southern France, Norman ones of opportunity in Southern Italy and Viking ones of conquest in England… But the arts were so much more ambitious!—but he’s totally right about the 980s. That can only seem like a good decade if you don’t remember it! After the sudden rush of major events lately described, the regular seminars in my incredible reporting backlog resumed on 13th May 2013 with Dr Philip Booth addressing the Medieval History Seminar in Oxford with the title, “Beyond Alfred Butler’s Conquest of Egypt“. The work in question here is old enough that it’s in the Internet Archive from its initial 1902 edition but it went into a second edition in 1978 and, according to Dr Booth, is still the standard text.1 He is, however, determined to replace it because he thinks the narrative in it is much too trustingly based on the ninth-century Arabic account of Ibn ‘Abd al-Hakam,2 and in this paper argued that a perspective from earlier, Christian, sources actually shows something more complicated going on. The story as it is usually told. “Mohammad adil-Muslim conquest of Egypt” by Mohammad Adil (talk) – who created this work entirely by himself, he says. Transferred from en.wikipedia. Licensed under CC BY-SA 3.0 via Wikimedia Commons. Images for this post have been really hard to search up. Apparently the only things from the actual settlement of Medinet el-Fayum that have ever been photographed are its modern water-wheels and a load of mummy portraits (which are both very cool but not relevant right here). At Antinoë, modern Ansinā, however, there is much less going on and so some of the Byzantine-era stuff is still standing. Hopefully this is it! All this doesn’t do much to explain the Arab conquest of Egypt or the lack of solid Roman resistance to it, although Dr Booth made some attempt at the latter; the History says that the Muslims came to liberate the Monophysite Christian Copts from the tyranny of the Orthodox Empire, for example, which maybe is what you feel you have to say after eighty years of Muslim rule, and of course John of Nikiu as we have it enters the story long after its beginning. Nonetheless, both texts seem to agree that two armies were involved, the main force coming along the coast but also a second, fast-moving one that would have come in via marginal, undefended territory (a caravan route, according to Elizabeth Fentress in questions), crossed the Nile very far down it and routed the few Roman forces in the area. John of Nikiu opens up with these forces falling back on Arsinoë to face attack from the south and then having to retreat further up the Nile to what is now Abūīt. Only then did the Roman forces regroup to meet a threat from the north in the form of the new army of ‘Amr ibn al-‘As, who therefore got ships sent down the Nile by Apa Cyrus, the Pagarch of Heracleopolis (as the papyri allow him to be identified) to bring up the cavalry force from the south, and rather than meet the Romans in the field besieged and took a fortress at Antinoë. A papyrus fragment from Antinoë, now in Oslo, sadly from two centuries before we’re talking about but showing why this evidence is perhaps not as much used as some other sorts. Oslo Papyrus Inv. 1648. 1. Alfred J. Butler, The Arab Conquest of Egypt and the Last Thirty Years of Roman Dominion (Oxford 1902, 2nd edn. 1978). 2. Ibn ‘Abd al-Hakam, Futūh Misr, ed. Charles C. Torrey as Ibn ‘Abd al-Hakam, The History of the Conquest of Egypt, North Africa and Spain, known as the Futūh Misr (New York City 1922), partly transl. Torrey as “The Mohammedan Conquest of Egypt and North Africa in the years 643 to 705 A.D.” in Biblical and Semitic Studies: critical and historical essays by the members of the Semitic and Biblical Faculty of Yale University (New York City 1901), pp. 279-330, online here. 3. And, unless anyone who’s using it actually does read Ethiopic, a further step is introduced by the fact that the edition of resort is a translation into English, R. H. Charles (transl), The Chronicle of John, Bishop of Nikiu, translated from Zotenberg’s Ethiopic text (London 1916). However, that wouldn’t necessarily serve you here as Dr Booth was introducing extra details that apparently only survive in later manuscripts of a translation of the Ethiopic into Amhari! 4. In his huge Witnesses to a World Crisis: historians and histories of the Middle East in the seventh century (Oxford 2010), which it must be annoying to have people already picking holes in. 5. Severus of Al’Ashmunein (Hermopolis), History of the Patriarchs of the Coptic church of Alexandria, ed./transl. B. Evetts, Patrologia Orientalis 1, 5 & 10 (Paris 1904-1914), 4 fascicles, repr. together as Sawirus ibn al-Mukaffa’, Bishop of al-Asmunin, History of the patriarchs of the Egyptian Church, known as the History of the Holy Church (Cairo 1942). 6. Bernard P. Grenfell, Arthur S. Hunt & David G. Hogarth with J. Grafton Milne, Fayûm Towns and their Papyri (London 1900); Robert Hoyland, “New Documentary Texts and the Early Islamic State” in Bulletin of the School of Oriental and African Studies Vol. 29 (London 2006), pp. 395-416. 7. Here he cited H. Omar, “‘The Crinkly-Haired People of the Black Earth’: examining Egyptian Identities in Ibn ‘Abd al-Hakam’s Futūh” in P. Wood (ed. ), History and Identity in the Late Antique Near East (Oxford 2013), pp. 149-167, and E. Zychowicz-Coghill, “Defining the Copts in the Conqquest of Egypt: minority representation in Ibn ‘Abd al-Hakam’s Futūh Misr in Robert Hoyland (ed. ), Minorities in the Mediterranean and Islamic World (Princeton forthcoming). 8. Just to cite the ones that Dr Booth did, P. M. Sijpesteijn, “The Arab Conquest of Egtypt and the Beginning of Islamic Rule” in R. S. Bagnall (ed. ), Egypt in the Byzantine World (Cambridge 2007), pp. 437-459; Sijpesteijn, “New Rule over Old Structures: Egypt after the Muslim Conquest” in H. Crawford (ed. )., Regime Change on the Near East and Egypt (London 2007), pp. 183-202; Sijpesteijn, “Landholding Patterns in Early Islamic Egypt” in Journal of Agrarian Change Vol. 9 (Oxford 2009), pp. 120-133. One could now add eadem, Shaping a Muslim State: The World of a Mid-Eighth-Century Egyptian Official (Oxford 2013). 9. Lastly one should add P. Booth, “The Muslim Conquest of Egypt Reconsidered” in Travaux et Mémoires Vol. 17 (Paris 2013), pp. 639-670, which was still forthcoming at the point the paper was given (though presumably even then beyond the point of change). I hope that this again delayed conclusion to the series of posts in which I try and work out my position on the importance of different agencies in frontier settlement in the early Middle Ages needn’t be as long as the last one. I’m also planning to concentrate it much more deliberately on Catalonia than the previous four, and if it talks to the Escalona and Reyes case about Castile that started me off on this it will do so more by setting up an alternative and implicitly inviting consideration than by actual address.1 That all said, its first and most important question is one to which their answer is important, which is: whom do we consider a lord in these situations? My answer, however, as usual takes a lot of words, so here’s a picture and you may if you choose pursue the text below the cut. At least one of these people is a lord even though one’s a lady. “Maior8” by Anonymous – http://www.mcu.es/archivos/MC/ACA/Miniaturas/miniaturas/llibre02/007.jpg. Licensed under Public domain via Wikimedia Commons.